There's outrageous demand for mobile devices and data, and Ruckus Wireless is a leader in the thick of it. Investors are on the move! Everything we size up today we're assessing from the mobile angle, as more people make use of mobile technology and more things are connected. All this creates a massive flow of data that can be difficult to manage (not to mention exciting investment opportunities), which is where Ruckus Wireless (NYSE:RKUS) comes into play. 1. What does Ruckus Wireless do, exactly? "We make and sell a wide range of wireless infrastructure products like high-capacity Wi-Fi access points, wireless control systems, and cloud-based Wi-Fi access and location services. We are best known for our innovations in the area of adaptive Wi-Fi technology, which we call Smart Wi-Fi, that improves the range, reliability and performance of Wi-Fi networks within highly dense and noisy environments like urban centers and stadiums. This is achieved through our patented hardware and software inventions that combine to continually form and direct Wi-Fi signals over the fastest paths for each client. We're also credited with the innovation of massively scalable software control systems that let customers manage tens to hundreds of thousands of access points within a public or private cloud network. Our solutions are used by service providers and enterprises to solve network capacity, coverage and performance challenges associated with the explosion of data traffic from wireless-enabled mobile devices now flooding wireless networks. Our customers now number over 40,000 around the world, including companies such as Sprint, Time Warner Cable, Mandarin Oriental Hotels, La Quinta Inns and Suites, the cities of San Francisco and San Jose, Calif., and many others." 2. What's your strategy for growing Ruckus Wireless? "Within the enterprise, our strategy is to exploit our leadership in the growing mid-market segment and our massive channel partner base with new 802.11ac products. We also see Wi-Fi cloud services as a growth area because they give our customers more information and analytics about their Wi-Fi networks, letting them now use Wi-Fi as more of a business tool and not just a free amenity for their own clients. We also see the small-and-medium-business market as an underserved and highly lucrative opportunity for our Smart Wi-Fi products and services. In the carrier, or service provider/mobile network operator space, we are one of the only suppliers of carrier class or utility-grade Wi-Fi. Our strategy in this space is to offer value-add solutions and options that allow service providers to move beyond vanilla wireless transport. We see indoor managed services offered by carriers and the growth of small cell systems as growth areas of the company." 3. Which leader has inspired you the most in your career? 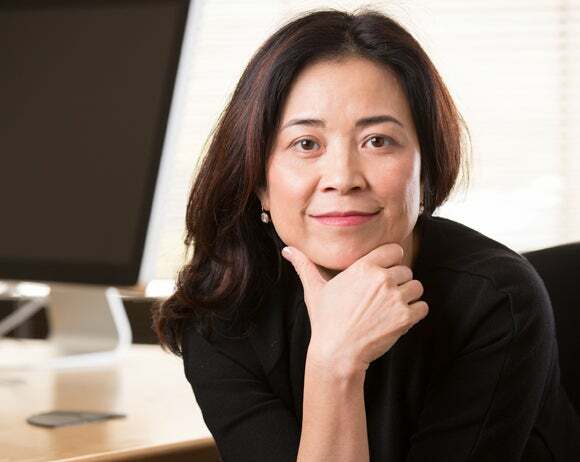 "I learned business and management skills from many great business leaders and managers I've worked for, including Karyn Mashima, Dominic Orr, and Dan Warmenhoven. I admire Hillary Clinton for her courage, tenacity, her willingness to fight, and her ability to compromise." 4. Ruckus Wireless is benefiting from the longer-term trend to mobile. What do you consider to be the biggest threat/challenge to Ruckus Wireless's continuing to pick up market share? What are you keeping your eye on? "Our industry is changing faster now than I have ever experienced, in technology cycles, business models and ecosystem. Wi-Fi is now playing a much bigger role in TMT [technology, media, and telecommunications] than just home and enterprise connectivity -- it's fast becoming an ubiquitous public-access technology offered by service providers, venues and public facing enterprises; it is the underpinning for Smart city and Internet of Things networks, and it is a platform for capturing analytics such as presence, footfall, apps and device usage. Our challenge is to expand into the most adjacent opportunities while continuing to grow market share in our core business." 5. What's your biggest challenge as a female CEO today? "My gender has nothing to do with the challenges I face as a CEO. It might have been more intimidating when I started because my investors, my board, and most of my customers were men, but I got over that years ago." 6. We love it when a CEO owns shares in the company she leads and takes the long-term view. You are young, you own a significant holding in Ruckus Wireless, and have been CEO since 2004. Is this your passion? Have you found the company you want to lead for decades to come? "I have been with Ruckus since the beginning. Over the last 10-plus years, I led the company's transformation from a residential IPTV/Wi-Fi play to the current service provider and enterprise Wi-Fi play. What drove my passion over the past 10 years was the opportunity to push the boundaries and create our destiny. As our industry continues on its rapid pace of change, I see Ruckus expanding its core business and creating new opportunities beyond, and I look forward to leading the charge." In many ways, investing is about finding compelling long-term trends and then latching on to the companies that will help shape them. And now, the world is going mobile. As the Internet of Things continues to develop, we will see more connected devices doing more things and using more data -- so we're going to need the infrastructure to handle it all. This, my Foolish friends, is Ruckus Wireless's specialty. And given the company's seasoned and smart management team, now looks like a stellar opportunity.